Cryptozoology is the study of hidden animals - such creatures are given the tag 'cryptid', for researchers within the field believe such 'animals' to be on the verge of discovery. Although mysterious beasts such as the Yeti, Bigfoot and Nessie remain out of the reach of science, there are some creatures that remain as reasonably valid cryptids - undiscovered creatures around the next corner, or species thought extinct but which resurface. Thankfully, the Natural History Museum harbours several creatures which are paraded in stuffed glory in those cabinets of curiosity, and which we may take for granted as tourists. The Thylacine (Tasmanian Tiger) is not the sort of animal you'd expect to see at the museum. This marsupial, native to Australia, has been thought extinct on mainland Australia for 2,000 years, and in Tasmania since the 1930s. Sightings still persist of the animal, mainly identifiable by its striped hind quarters. 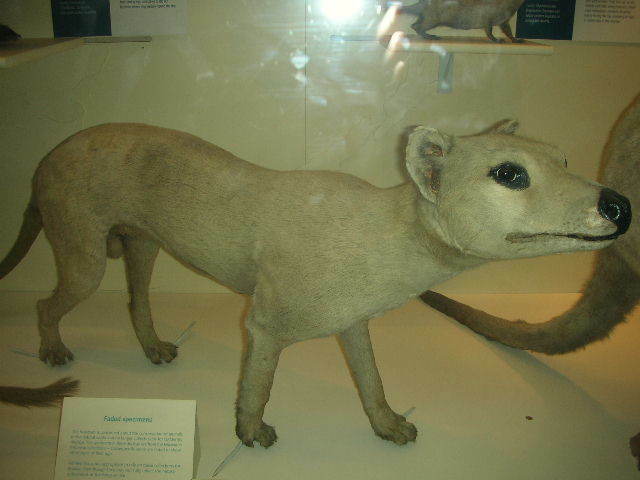 No definite proof exists to suggest these animals still exist although sightings persist, but the Natural History Museum does house a stuffed, albeit faded specimen. The museum also holds a moa skeleton. The moa was a flightless bird from New Zealand that stood around 12ft in height. They were thought to have been hunted to extinction by 1500AD, and so to see such a magnificent skeleton at the museum is a sight to behold. Sightings still occur, but with irregularity to suggest misinterpretations or hoaxes. However the coelacanth, one of which sits pickled in a museum tank, remains one of the most fascinating creatures. Considered a living fossil, such a fish was thought extinct by the end of the Cretaceous (145 - 65 million years ago) period until one specimen turned up off the east coast of South Africa in 1938. This fish was not alone, as many have been found in waters of Kenya, Tanzania, Mozambique, Madagascar and other places. We take such exhibits at museums for granted, gazing at the prehistoric skeletons like some long-lost form, but lest not forget that the true monsters of such places are those that could still be lurking in our woods and waters.